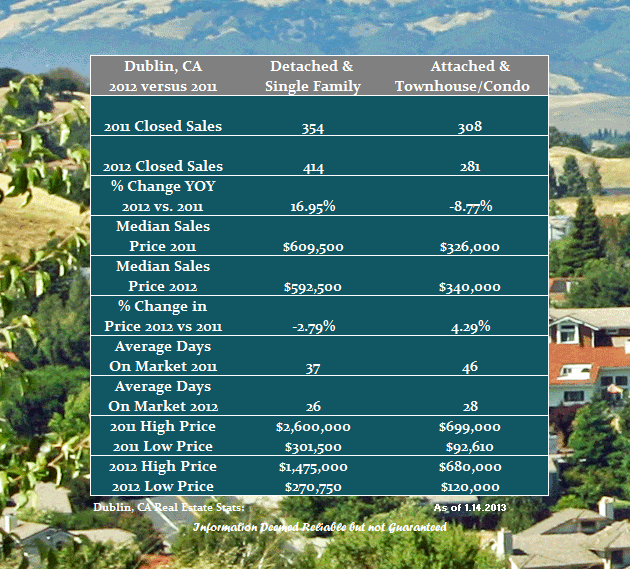 The Real Estate Market in Dublin and San Ramon certainly enjoyed an active 2012. The entire 680 Corridor Real Estate Market seemed to come alive at the end of the first quarter. Those of us on the front lines experienced the changes in advance of what would be more positive reporting on the state of the local housing markets as the year went on. The performance of Dublin and San Ramon will be the first two markets I focus on followed by: Danville, Blackhawk, Diablo, Alamo and Walnut Creek. Single Family home sales in Dublin boasted an almost 17% gain in sales in 2012 as compared with 2011. The median home price actually fell a little over 2% but keep in mind that this is a city wide sample and certain neighborhoods may have actually performed better. The time it took to get a home into escrow fell to 26 days in 2012 from 37 days in 2011. Dublin Condominiums & Townhomes saw the number of total sales decline in 2012. This segment of the market was the first to experience the shortage of inventory of homes for sale which would continue through the end of the year. Median prices rose a little more than 4% and the time it took to get into escrow dropped to 28 days from 46 days in the prior year. The performance of the San Ramon Real Estate market was only slightly different than Dublin in the fact that all arrows “pointed up”. Single Family homes experienced a 5% increase in unit sales and saw median prices rise a little less than 3%. 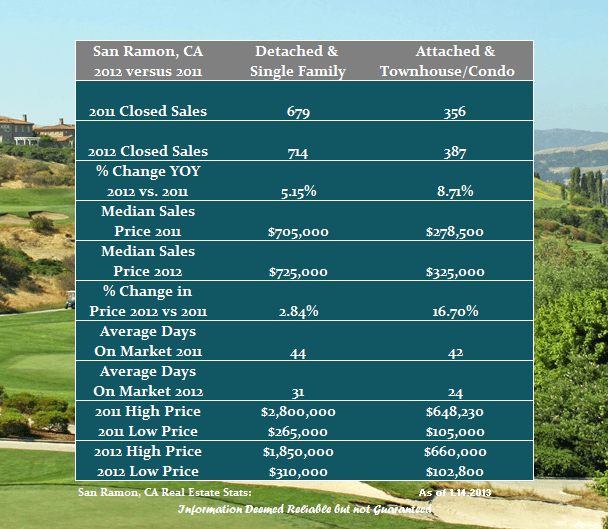 San Ramon Condominiums & Townhomes had unit sales increase a little less than 9% and median prices rose over 16%. In both areas marketing times were dramatically lower than 2011. We begin 2013 where 2012 left off. A lack of inventory of homes for sale in both Dublin & San Ramon, low interest rates and a steady stream of interested buyers should keep things “hopping” in the first quarter. If you are in the market to sell or buy in San Ramon or Dublin give me a call. I would be happy to review what the current market looks like in your neighborhood or area of interest. Share the post "San Ramon & Dublin 2012 Real Estate Market Watch"